It is well known that, apple cider vinegar is an ingredient found in any storage cabinet, primarily because of its ability to spice up many different meals. Nevertheless, homemade apple cider vinegar has been used as a natural medicament for a myriad of ailments for hundreds of years. Even though the vast majority of its medicinal properties are not scientifically proven, there are a huge number of studies that have provided evidence that apple cider vinegar is healthy. For instance, a scientific study performed in Japan included 175 people dealing with obesity who practiced almost identical diets aside from some of the applicants used homemade ACV every day while the rest of the participants used some other dressings and spices. When this scientific study was finished, people who relied on apple cider vinegar were able to lose significantly more weight compared to the group of individuals that didn’t use apple cider vinegar. Experts are convinced that apple cider vinegar has the ability to trigger specific genes in the body that may accelerate and support breakdown of fat. In addition, apple cider vinegar has proven to be very efficient when it comes to reducing blood sugar levels. Carol Johnston, PhD and head of the main nutrition program of Arizona State University, says that apple cider vinegar has the ability to block starch digestion and this is one of the main reasons why people experience sudden increase of levels of blood sugar. According to Johnston, apple cider vinegar has anti-glycemic properties that were scientifically proven. Even though this type of vinegar doesn’t stop the starch completely, it can prevent significant amount of starch from digestion and prevents boost of blood sugar levels. The vast majority of people buy commercial apple cider vinegar found in health food stores and regular stores, but most of them are unaware of the fact that they can make one at home. The following is a detailed guide that will show you how to prepare apple cider vinegar. Adequate amount of water to dip the ingredients. Put the apple peels and cores in a clean glass jar. Pour water in the jar until you notice that all of the peels and cores are under water. Put the organic honey and stir well until the honey is dissolved. Put a paper towel on top of the jar before sealing it. Leave the mixture like that for 15 days before straining it. 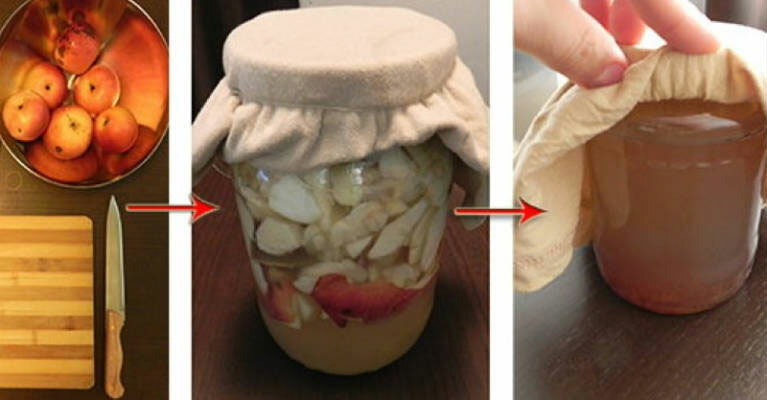 Remove the solid content from the jar and put the liquid back in the jar. Leave it like that for one month and stir it on a daily basis. That’s it! Your homemade apple cider vinegar is ready! Homemade Sleep Remedy – Take One Teaspoon Before Bed and You Will Never Wake up Tired Again!